This is a bit of an update for the Wellington Harbour and the Kapiti Coast. Not sure how many of us down here fish using the kites, however I get a lot of curious onlookers stop and talk, asking what I'm doing. So I'm guessing there's only myself and a handful of others. With the east to southeast wind pattern over the past month, and some warm water from the north, the fishing here has been great from beaches inside Wellington Harbour and the Plimmerton end of the Kapiti coast. The fishing in Wellington Harbour can bring some good catches and today was one of them. Previously kahawai, gurnard and blue cod have all fallen victim to the Small Pocket Sled Kites. However Sunday was a real highlight for any fisherman. I set eight hooks out with the Bottom Longline and Delta kite. I sent it out towards the shipping lane. 45 minutes later I landed the snapper I have always dreamed of. One nice 20lb snapper. Snapper this size are uncommon in Wellington and this fish was a real gem. If only I had entered the Plimmerton fishing contest on this weekend... I think this fish would have won it for me. This was my very first time using my Delta Kite, and a Bottom Longline Rig. A quick 15 minute set, with 10 hooks landed seven fish. Four nice sized gurnard and the rest small, just under a metre long, mako sharks... they had a good set of teeth! Needless to say the makos were set free, and the gurnard enjoyed by my wife and I the following day. The water around the Kapiti coast is warm, and it is producing some nice fish. I usually use squid for bait when using the kite rig and it seems to work. NZ Underwater have proposed a huge marine reserve for the area surrounding Tiritiri Matangi Island and the end of Whangaparaoa Peninsula. A marine reserve denies fishing opportunities for everyone and this one is proposed in one of the most recreational fishing areas in the gulf. Don't forget, once a marine reserve is in place it can never be reversed. This proposal has serious implications for all fishermen, land based and boat fishers. The people who fish this area need your help. Your support will go a long way towards getting a coordinated approach to the very real access threat marine reserves pose in the Auckland region. Only four people responded to this alert last week. It is time to have your views considered. Click here to read the details and HAVE YOUR SAY. It only take a couple of minutes! 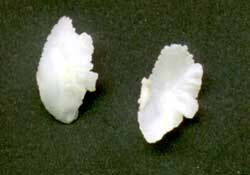 Otiliths are the ear bones of a fish. They are used for balance, orientation and picking up other fish in the water. Scientists use otiliths to study fish populations, fossils, diet of other species and are particularly helpful when determining the age of a fish. Hugh Grenfell from Waikato University was the guest speaker at the recent Kite Fishing Club meeting. Hugh is a scientist and spent many years scouring the rocks around Parengarenga Harbour looking for otiliths in amongst the rocks for his masters degree. From the otiliths he was able to determine the species of fish the otiliths came from and the relative age of the fish. The combination of overhead slides and his knowledge made it an interesting evening for all members. Mal Riley supplied a fresh snapper head that Hugh expertly cut in half to extract the otiliths pictured above. There are three otiliths in a snapper, these two and one smaller one about the size of a pin head. The saccular otilith is used in the aging process. In simple terms, scientists cut these saccular otiliths in half, burn the end and put it under a microscope. They can then count the rings and calculate the age of the fish. Each species of fish has a specific shape otilith, and there are some variations in amongst the same species. Hugh's particular interest is in palaentology. Otiliths change in shape and size as the fish ages. They can survive for centuries in rock and soil. Using otiliths scientists determine the environment in pre-historic days, the diets of ancient people and assess how big the fish were when eaten. Hugh's expert knowledge and enthusiasm made for an interesting night at the Kite Club meeting. Hugh Grenfell spent some time at the Kite Fishing Club meeting discussing the weed problem. Members were particularly interested to know what causes the weed and how to avoid it. The two of most concern to kite fishers are the lettuce-like weed found around Tauranga Harbour and the red sack weed that is found off the east coast (a form of Dynoflagellate algal bloom). Algal blooms can be red, brown or green in colour. Some are toxic to fish and can suffocate the fish by infecting their gills. Weed is concentrated in areas by ocean currents and can proliferate in areas where there are sufficient nutrients in the water to survive. Areas such as harbours have nutrients running into the water from land use and this can create the right conditions for the algal blooms to form and multiply. The weeds are introduced species and Hugh also mentioned the weed is not found on the west coast. He suggests if anyone is moving a vessel from the east coast to the west to make sure you clean it thoroughly. Clean the prop, vessel and for kitefishers, be conscious of any foreign matter on your gear. Wendy Nelson is the contact person, check with her before sending a sample. Wendy goes out on field trips so can be away for several days at a time. Another suggestion is to contact your local DOC office and talk with their marine representative. They are keen to know if there are localised problems with weed. In response to a question regarding safety traces on kites, Paul has devised this clever way of having a safety link instead of a safety trace to protect your kite. This overcomes the issue of having a safety system which will always break apart in the water but will never part while the kite is in flight. Instead of a weak safety trace between the keel and flying eyelet try this system. If the kite goes down the candy dissolves and the kite is easily retrieved by the recovery line clipped around the wing spar. This system can be used with nylon or dacron loops. It incorporates the use of loops and soluble confectionery. If you are using dacron for the loops it is easier as you only need a 6 inch loop on each piece and it will grab onto the lolly. Candy cane or barley sugars work well and auto release after 10 minutes, lifesavers take 4 minutes. This system releases every time your kite goes into the water and the kitefishers using this system are adamant it works every time. Knots for this safety system are simple and can easily be mastered. Use the following link to our new site under construction to find out how to correctly tie these knots. At last an easterly wind on a fine day. Great day out at Muriwai on Monday this week. Although once again, the wind was not overly strong. There was a huge rip running up the beach which meant it was difficult getting the gear out to a decent distance. First set of 10 hooks of the Dropper Rig, after high tide, produced one shark and three snapper. 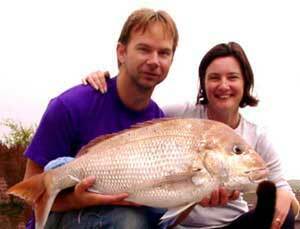 The biggest snapper weighed 2.5kg, the rest were all pan-sized. On the second set I caught another snapper....it was very tasty indeed. As the rip was so strong through the wave area, I launched my second kite with an attachment approx 40 metres down the kiteline. The kite was attached to my truck on a 130 metre line. This allowed me to run my main line through the attachment and lift it clear of the waves, the rip, and the surfers who think they own the waves. By using the second kite, I was able to set right out to the full 1000 metres. I have attached some floats to some of my traces. I used a mixture of the Floating Bead Traces from Paul's Fishing Kites, as well as traces fitted with wine corks painted fluorescent pink. I caught fish on both sets of floating traces as well as the traces with no floats. This catch sample is too small to determine which traces work the best, so I will keep trying all of them. I spent some time talking to another fisher on the beach. He and his family had caught over 50 mullet using a net. Took them less than an hour....he had a big family to feed. Looking forward to more fishing out there once the rain stops. Ed: The west coast beaches are closed to all set nets however it is legal for amateur fishers to use a drag net (also often referred to as a beach seine net) in any of the set net closed areas on the west coast to target any species. Steve went fishing at Ruapuke on the Raglan coast last weekend. Using a Big Dropper Rig Steve put out two sets of 18 hooks. Using squid for bait he caught five snapper and two other fish. He fished over the the high tide and there was a light southeasterly wind blowing. Rob at the shop has had some excellent fishing reports in the past week. One of the most impressive reports is one from the Mangere Boating Club competition held on Sunday March 2nd. It was take a kid fishing day and one crew took a 7 year old girl, 'Bee' Morris, out in their boat. This little girl managed to catch a 10.3kg snapper and take out the prize. The winning fish was caught near Puketutu Island on the Manukau Harbour. Bee was using a Target Snapper Hook when she caught this fish. A regular kitefisher, Abdullah, called into the shop to see Rob. He has been kitefishing out at Kariotahi Beach, south of the Manukau Harbour entrance. Abdullah set his Dropper Rig out and landed two sharks and a 4.5kg snapper. Snapper of this size should be more common on the west coast over the next few months, so now is a great time to be out kitefishing. Another keen kitefisher has been trying his luck out off the East Coast Bays of Auckland. Using a Flexiwing Dropper Rig he has been successfully catching snapper up to 2.5kg. Keen as he is, he has been struggling to catch a fish lately. After reading all the reports about the new Floating Bead Traces it was time to give them a try. There was nothing to lose. As soon as he started using the new traces his luck changed, now he doesn't want to use anything else. Nathan took his Dropper Rig to Himatangi Beach in the Manawatu. It was Saturday March 1st and there was a moderate easterly wind, this made it easy to get the rig to set straight out. On an incoming tide Nathan put out four sets of ten hooks. Using salted mullet for bait he landed two sharks and five gurnard. We have a new solution for retrieving kites that have gone into the water. It's a great way to relaunch your kites when they are way out to sea and in the tide. Grant Dixon from NZ Fishing News spent his Christmas holidays at Waipu, on the east coast of Northland. He called us to advise that he found two kites snagged on the reef 800 metres out from the beach. Unfortunately this means two kitefishers lost their kites while fishing there. Neither kite had a safety float attached. If a Kite Safety Float, or the above balloon system had been used, the kites could have been recovered. At $8.00 floats are cheap insurance against losing a kite. It is highly recommended you use a Kite Safety Float when using the larger kites. I am leaving Paul's Fishing Kites this week. Thanks to all those who sent in fishing reports and your great pics. You certainly made it interesting for all of us. Please keep sending your reports in so we can all keep up to date with who is catching fish and where. It's been a great year and I have enjoyed meeting and corresponding with so many of you. Thank you to those who have sent in reports. If your report has not appeared yet, it will be published soon. We are trying to get a good spread of information from around the coast. If you go fishing send us a Beach Report. This lets everyone know where the fish are biting. Don't forget to take your camera when you go fishing and take some pics. Without these reports we have very little information to put into this newsletter. Please take a couple of minutes to fill out the form and let everyone know what fish are out there. If you are concerned about divulging your exact fishing spot just give us the name of the beach and the area if this is appropriate. It all helps to have a better idea of what is being caught and where. The reports do not have to be recent; if you have information from past fishing trips these can be input as well. Even if you caught nothing on your last fishing trip the information is important as it helps to build a real picture of what is happening at that particular beach. Any information about your kitefishing, surfcasting, boat, kayak or kontiki experience is welcome. Thank you to all those who have contributed to the database so far. Once we have enough reports in the database we will post the average catch by month on the appropriate maps. If enough people send reports in you should almost be able to work out what you will catch before you leave home.